It's no secret that most of us love the fabulous colors and simple designs of the wildly popular mini blinds. It's the mini blinds cleaning that we have yet to warm up to. Whether your blinds are mini, macro, wood, vertical, or horizontal, all have one thing in common: They're magnets for dust, animal dander, kitchen grease, and soot. And, they have to be thoroughly cleaned at least once a year to look bright and fresh in your windows or doors. 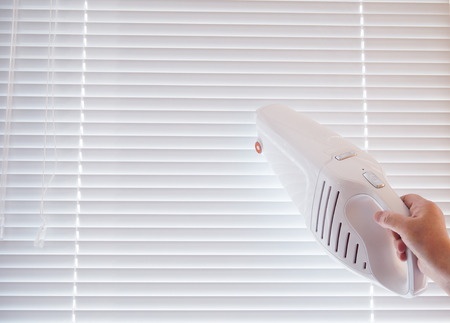 Dust, vacuum, or blow-dry mini blinds regularly. To clean wooden painted louvers, tilt them almost all the way up and wipe them with a cloth moistened in a mild detergent solution; then tilt them almost all the way down and wipe again. This ensures that you clean the middle, too. Do not wet stained wood shutters because this may damage the finish. Instead, clean them with lemon oil or a wood preservative. Probably the most efficient way to wash vinyl or metal mini blinds is ye olde traditional method of taking them down and immersing them in a bathtub full of soapy water. Vacuum or dust vertical blinds regularly, especially along the floor. If you have pets, use a pet brush to remove pet hair. Don't wash or dry clean fabric vertical blinds. Clean vinyl or aluminum vertical blinds with a damp cloth. Leave a light film of detergent on the vanes to reduce static electricity. If your water is hard - if you notice water spots on your dishes, your water is probably hard - rest assured it will do the same to your blinds. In this case, you'll want to wipe the blinds dry with a towel immediately. To keep the buildup of dust and dirt to a minimum, dust twice monthly with a lambs-wool duster , or Masslin heavy duty dust cloth with microbes or other dust-collecting cloth. You can also use your vacuum cleaner's wand attachment. To thoroughly clean away all the surface dirt and dust, tilt the slats all the way, run your duster of choice along the surface, then flip the slats the other way. Some valances and curtains are washable, especially if they aren't lined. Before washing, examine them for sun rotting. If they have rotted, don't bother washing them, just replace them. If they're not washable, have them professionally cleaned.